We are forgiven, we are saved and redeemed – Christ is risen! These three words say everything. They are the foundation of our faith, our hope, love, Christian life, all our wisdom, enlightenment, the Holy Church, inner prayer, and our entire future. These three words have destroyed all human woe, death, evil, and have given life, bliss, and freedom! What miraculous power! Can one tire of saying: Christ is risen! Can one tire of hearing: Christ is risen! But do all of us understand the true meaning of those three words: Christ is risen? What does it mean: Christ is risen? We know that Christ did not arise today, nor yesterday, but many, many centuries ago. And who in our times can doubt that Christ truly arose on the third day? Obviously no one! So what, then, are we attesting to when to the greeting of “Christ is risen!” we respond with the words “Truly He is risen!”? Are we attesting only to our faith or to something more? Christ’s Resurrection is affirmed within us, within our hearts not only by the words “Truly He is risen!” It is affirmed by joy in the Lord and proven by love for Christ. Whoever loves, understands God’s love and does not doubt it. But remember, dear brethren, your recent confessions, how you repented of grumbling against God, of doubting His mercy, how you accused the Lord of your supposedly undeserved sorrows and unbearable sufferings, even of not heeding your prayers! Remember how, though living in sin, you nevertheless were wont to look upon the Lord as unmerciful, as deaf and blind to your woes and needs! But now, having become united with Christ, have you realized that He is the God of love, the God of mercy, not punishment? 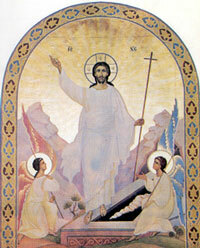 If you have truly recognized this truth, then undoubtedly you have understood God’s intention, you have come to love the Lord with a pure heart, Christ has risen within you, and you can now in all conscience respond to the joyous Christian greeting “Christ is risen!” with the words “Truly He is risen!” Amen.